Another recipe from The Elder Scrolls V: Skyrim. Like the honey nut treat, this food does not have an in-game recipe, so I just implemented some nordic baking techniques to make this recipe. Cream the softened butter and 1/3 cup of flour in a small bowl. Spread onto a large sheet of wax paper and press another sheet on top of the butter. Place this butter sheet into the fridge and allow to chill. 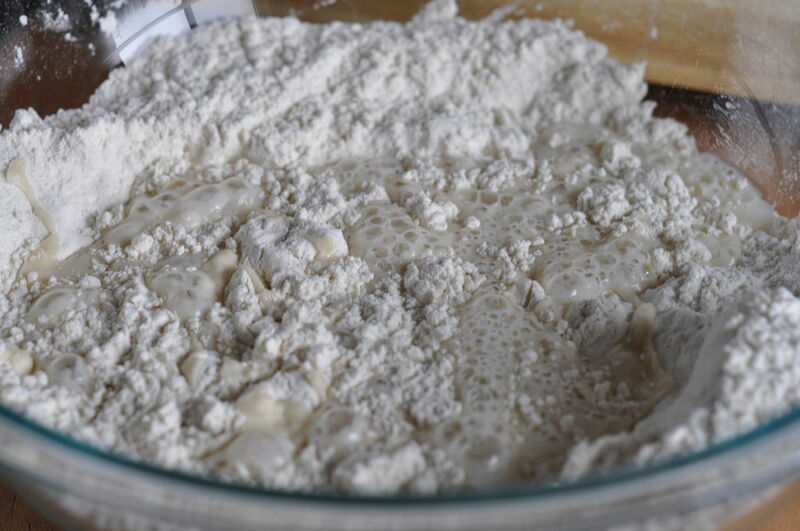 Mix the dry yeast and 2 cups of the flour in a large bowl. Heat the milk, sugar and salt on low until warm, about 110-115 degrees F.
Pour the warm milk mixture into the flour mix along with the eggs, almond extract and cardamom and mix well by hand or using the dough hook attachment of a mixer. Slowly add in the remaining two cups of flour, allowing the dough to come together of the dough hook (or really wearing out your arms!). Cover the bowl with a moistened tea towel and allow to rise in a warm area until the dough has doubled in size. Begin to heat 3/4 of the milk and vanilla extract on low heat in a medium sized pot. In a medium bowl, lightly whisk the yolks and sift the flour into the yolks, stirring constantly to prevent lumps. Slowly add the sugar and remaining 1/4 cup of milk. When the milk is nearly boiling, slowing whisk the milk into the egg mixture, stirring constantly. Return the entire mixture back to the pot and heat on medium low. Continue stirring the creme until it begins to thicken to a pudding consistency. Transfer to a bowl and cover with plastic wrap to prevent skin from forming. Allow it to cool. Roll the dough out into a long rectangle on a lightly floured surface. Peel the wax paper of your cold butter sheet and set it on top of the dough rectangle. Fold the dough over itself and press down on the edges to seal them. Roll the dough out again into long rectangle. Fold the dough like a letter and roll out again. Continue rolling and folding the dough a few more times. When you are ready to bake, preheat the over to 400 degrees F. Bake until golden brown, about 10 minutes. While the pastries is still warm, you can press down the indentations once again. Heat the milk and vanilla in a medium saucepan and heat over low heat until warm. Place the milk in a bowl and sift the confectioners' sugar into milk mixture. Whisk well to get rid of lumps. Once the pastries have cooled, glaze them by your desired method (pastry brush, dipping, icing rack). Spoon a dollop of the cooled boiled creme into the indentation in the center. Enjoy immediately or refrigerate in air tight containers! Do you have a glutten free alternative? Wow! What an awesome idea! I have to make this one time! Pro tip: Dont surf instructables while hungry or you might eat the screen. What do you do with your leftover egg whites? Possible add. Made a sweet merengue top over, return to oven a few, serve warm. Go light on the glaze tho. I usually use my leftover whites in a omelette, if you wanted to forgo glaze (the dough isn't super sweet so I wouldn't recommend it) you could use the white for an egg wash with a little bit of water.